Advanced OBGYN Institute Providers Kompal Gadh , M.D. 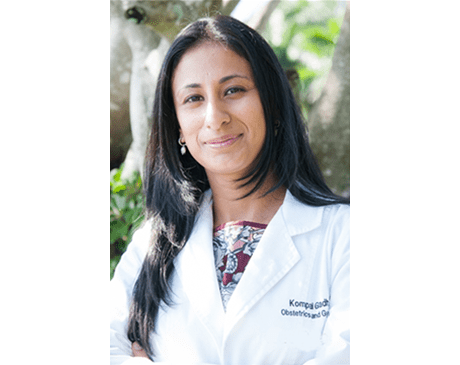 Dr. Kompal Gadh is a board certified OB/GYN who offers services to patients in Weston and Pembroke Pines, Florida, at the Advanced OBGYN Institute. Over her many years in practice, she has helped thousands of women and families embrace their health, enjoy healthy pregnancies, and achieve their reproductive health goals. She works with women throughout their lives, from puberty through their senior years. Dr. Gadh believes that each woman's unique needs and desires should guide their care. Throughout her medical career she has given OB/GYN care to women from many different cultural backgrounds. Dr. Gadh received her medical training at Dayanand Medical College followed by an internship in obstetrics and gynecology from North Shore University Hospital and a residency in obstetrics and gynecology from Danbury Hospital. She's a Fellow of the American College of Obstetrics and Gynecology and has been awarded the Broward Family Favorite award from Broward Family Life magazine. She is fluent in both English and Hindi. "The staff is very friendly and they all make you feel very comfortable." "The office is very clean and open, lots of patients coming in and out all the time. " "Pleasant staff, prompt appointment, knowledgeable doctor. Great experience!" "Dr. Gadh is a very nice and compassionate dr she's very thorough and explains everything"
"Awesome doctor. I will strongly recommend her to my friends." "Dr Gadh is personable and has great bedside manners." "Ms. Blumberg is very nice. She listens to the patient."